Published on November 29, 2009 in General. 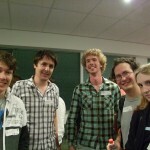 2 Comments Tags: Black Lab Games, Different Methods, IGDA Perth Chapter, Innovation Centre, iParty 2.0, Let's Make Games, party, photos, Reveries, RocketHands, Subversive Games, write-up. 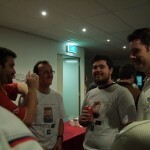 iParty 2.0 was a great success with around 100 people attending! Special thanks also to all companies that contributed to the showreel (apologies to Binary Space for not getting their “Class 3 Outbreak” teaser in) and to Game Pride for bringing along some laptops to demonstrate their latest game “Boo!”. Thanks also to Ben, who took most of the photos. Anthony (Let’s Make Games Treasurer) returns from his wedding just in time to sort out receipts and payments. What a champion! 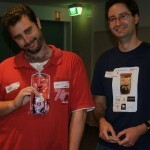 I asked Paul and Alex to look glamorous while presenting the prizes. 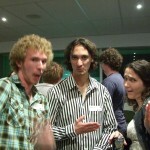 Alex looks suitably Wheel-of-Fortune while Paul looks disinterested (his tactic is obviously “hard to get”). 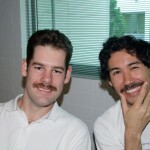 Jim and I were happy to see so many other mo-bros at iParty 2.0. 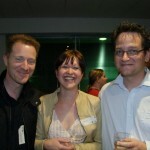 Jean-Marie (Subversive Games), Christel-Lee, and Simon (Different Methods, Subversive Games) kindly pose for a photo from the paparazzi! 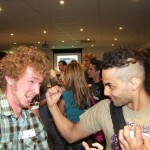 Tim intimidated Simon with his superior hair. 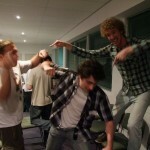 Simon succumbs to a natural reaction. 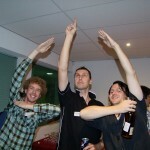 Not content with their already tall statures, Simon, Shanon, and Greg reach for the sky. The crowd during the raffle draw (image also features Simon’s hair). 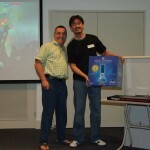 Greg looks happy with his Krumpler laptop bag, and Paul (Black Lab Games) somehow managed to time the prize presentation to coincide with his game (Star Hammer) being on display behind him! Phillip warmly thanks Avril (from Reveries: Virtual World) for his slick black keyboard and mouse. 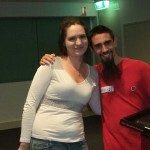 Stewart was the first volunteer to arrive and made a huge difference on the night! Here he is coming up to draw a raffle prize. 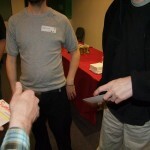 The game in Jetha’s hand somewhat contradicts the game (logo) on his shirt. 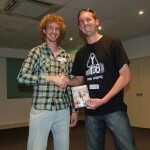 How is that title even related to this image of Saxon drawing a raffle prize winner!? 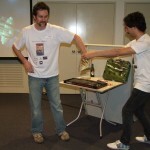 Saxon (from Binary Space) awards Jeremy his Krumpler mini-case. Jeremy totally loves it. Simon and Alex looking cute. Go team! 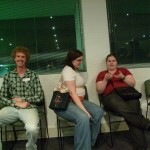 It’s life imitating art (previously Simon was content to just photoshop himself into all group photos). Now *that* is what I call eyebrow furling! 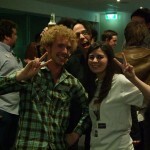 At this point I realised that Simon was in every single photo taken after I handed the camera to Benny Goodtimes. Liza gets in between Jeremy and Simon. Three games companies in the foreground (and one in the background). It’s difficult to appreciate how tall Shannon and Simon are in this picture. Paul isn’t a short man! Is apparantly more accessible than Jeremy’s. He looks like he knows it too. It looks like Jeremy is chuffed with a joke he told… but actual responses are fairly mixed. Literal caption: Rowan is looking at Rj’s hair. There are always a few rowdy types that ruin the end of the night for everyone. Chris (PIGMI overlord) is back from the UK! A low-angle shot that’s still above board. This upcoming “Summer” exhibition looks interesting. Everyone should go. 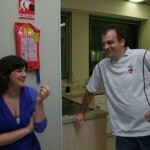 iParty’s over… but Kitchen Party is just beginning! Oh Tone! You’re so funny. Published on November 25, 2009 in General. 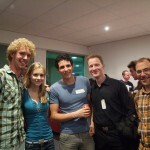 5 Comments Tags: iParty 2.0, party, reminder, RSVP. We’re planning for around 100 people (based on 44 confirmed attendees on Facebook and around 30 RSVPs via email or the contact page; we usually get around 50% more people than RSVPs), and we will have food and drink to accommodate. If you know game developers, related industry professionals, or game development students who aren’t attending – please spread the word and ask them to come along! That said, it’s always better to have better numbers. 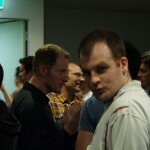 So if you haven’t yet RSVP’d, but expect to attend (I’m looking at you James and Cameron), please RSVP ASAP! Are you ready for iParty 2.0? Published on November 23, 2009 in General. 0 Comments Tags: demo, iParty 2.0, volunteers. 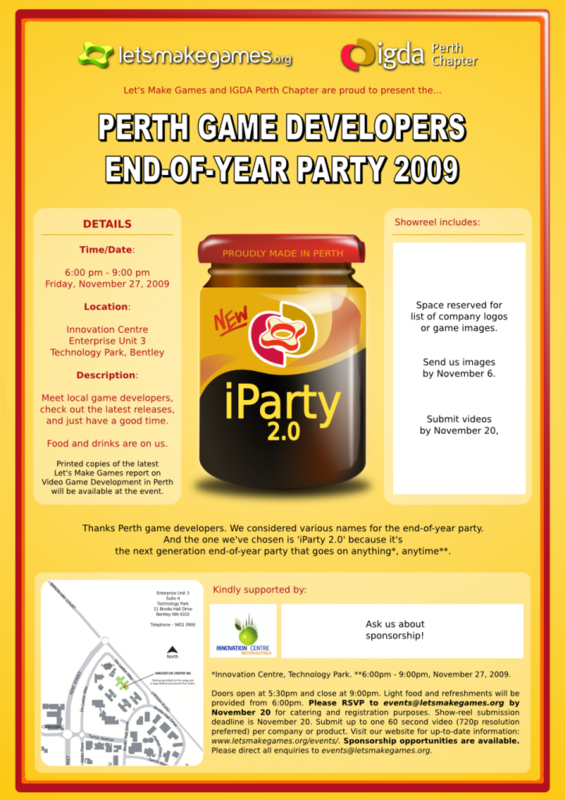 iParty 2.0, the end-of-year party for the Perth game development community, is on this Friday (27 November), so make sure that you are free from 6pm-9pm! The response to our call for volunteers has been huge, so a big thank you to everyone who replied. All required positions have been filled in record time! We’ve extended our showreel deadline to 5pm Tuesday. It’s easiest if you just upload your video to an online host (such as YouTube) and send us a link. Remember that videos are to be no longer than 1 minute (unless you are a sponsor) and you can only submit one per company and product. That’s all for now, but be sure to check back throughout the week (or subscribe to our RSS feed) for more details on the event (including easy-to-follow directions to the venue). Published on November 11, 2009 in General. 0 Comments Tags: Black Lab Games, Different Methods, Innovation Centre, iParty 2.0, news, Reveries Virtual World, RocketHands, sponsor, Subversive Games, thanks. 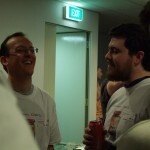 Different Methods: Apparently Simon is not content with just organising local and global Game Jams, hosting and maintaining Planet PIGMI, and undertaking some of the most amazing games-related work in Perth. He’s also come on as our biggest sponsor, making us feel all warm and fuzzy with his support. Innovation Centre: Always keen to lend a hand to local industry groups (such as ours!) 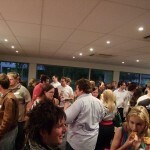 the Innovation Centre kindly offered the use of their fantastic professional events venue. Our drinks will be kept cool in their fridges and our work will be displayed on their projector and plasma screen. It’s great! 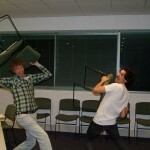 Subversive Games: Subversive creates training games and advergames for the rapidly expanding serious games market. 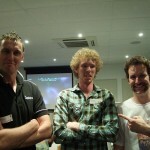 One of a handful of larger professional games companies with a studio in Perth, Subversive Games continues to show it’s strong support for the local scene. 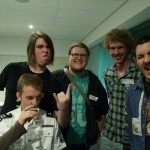 Rockethands: If the group shot on their website is anything to go by, Rockethands are the coolest game developers in Perth… ever. You can tell that they keep it real, and evidently put their money where their mouths are. We know that money can be hard to come by for indie developers and it means a lot to us that you guys have sent some our way! 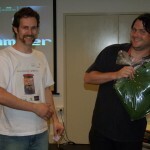 Black Lab Games: The latest game development initiative by one of Perth’s veteran game developers (Paul started his first games company back in 1992!) 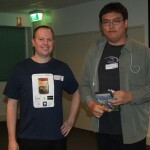 Paul has an infectious passion for games and independent development, which he shares with others as a founding committee member of IGDA Perth Chapter. Reveries Virtual World: Avril is obviously a real trend-setter, jumping right in as our first financial sponsor. 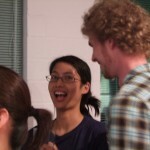 Reveries has all of us at Let’s Make Games very excited with anticipation. Thanks for being so forthcoming in supporting our community events Avril! 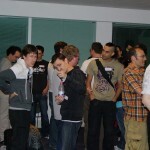 With all this support iParty 2.0 is shaping up to be the best night of the year for local game developers. If you haven’t yet RSVP’d, please do so using the contact page or by registering for the event on Facebook. It’s a free event with food and drinks provided (thanks to our awesome sponsors!). See you all in just over 2 weeks! Published on October 27, 2009 in General. 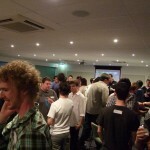 1 Comment Tags: end-of-year party, event, game developers, IGDA Perth Chapter, Innovation Centre, iParty 2.0, Let's Make Games, party, RSVP, showreel, sponsorship. Update: It was a great event! Click here for photos. 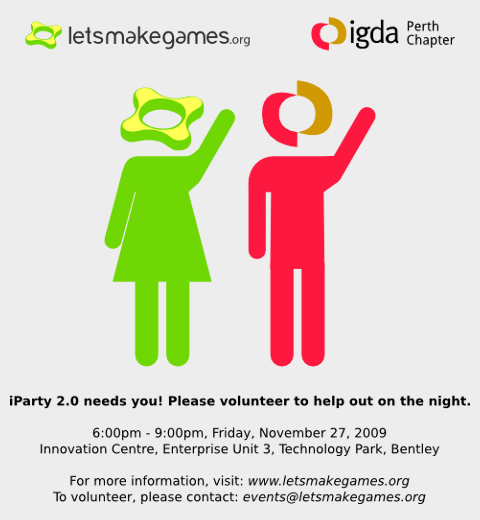 Let’s Make Games and IGDA Perth Chapter are proud to present iParty 2.0, the greatest ever end-of-year party for the Perth game development scene! 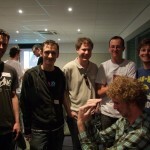 2009 has been an amazing year for the Perth game development community – with many local game releases, community events, and a number of new companies starting up. 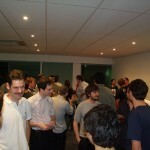 The end-of-year party is all about celebrating and showcasing these achievements in a relaxed and friendly atmosphere! 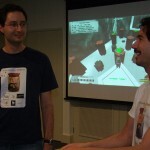 Description: Meet local game developers, check out the latest releases, and just have a good time. Food and drinks are on us. RSVP by November 20 for catering and registration purposes. As you can see a few areas are blank and we need your help to fill them in! If you are a local game developer who intends to submit a video for the showreel, please send us some screenshots and a company logo by November 6. Your final showreel videos will be required by November 20. Showreel video submissions are limited to one 60 second video (720p resolution preferred) per company or product. 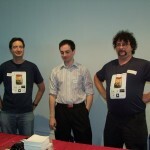 So a company with two products released or under development in 2009 can submit a total of three videos (one for the company and one per product). If you already have a suitable video online, just send us a link to it! If you are interesting in sponsoring the event, please contact us for more information as we have many options available (from contributing to food and drink costs to providing raffle prizes). Sponsorship is a great way to get your name out in front of local developers – or just to show your appreciation for the local scene! We’ll release the final print-ready version of the flyer (with game screens and sponsor logos) on November 10. Friday 6 November 2009: Final flyer image deadline (for sponsors and showreel screenshots). 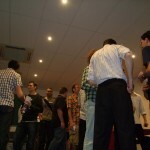 Friday 20 November 2009: RSVP deadline (for catering and registration purposes). 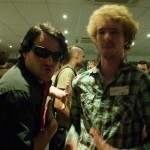 Showreel video submissions deadline. 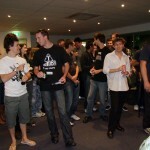 Friday 27 November 2009: iParty 2.0! 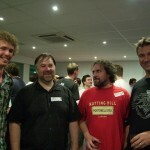 Also be sure to subscribe to our RSS feed (or check back regularly) for more information on the event. Feel free to ask any general questions in the comments section and we will try to answer them ASAP! 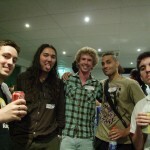 Help spread the word online; This will be the biggest party of the year for the Perth game development scene and we want to see you all there! 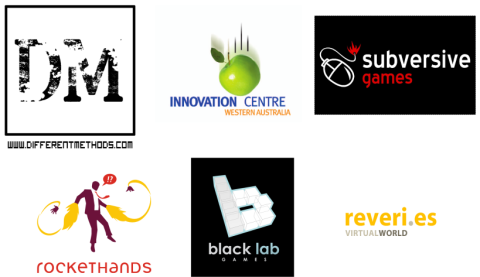 Update: Oh, I almost forgot to extend a HUGE thanks to the Innovation Centre who are our venue sponsors for the event. We wouldn’t have such a fantastic environment (or as much money available for food and drink) without their generous support! 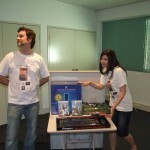 The Let's Make Games archives for the iparty-2-0 tag.